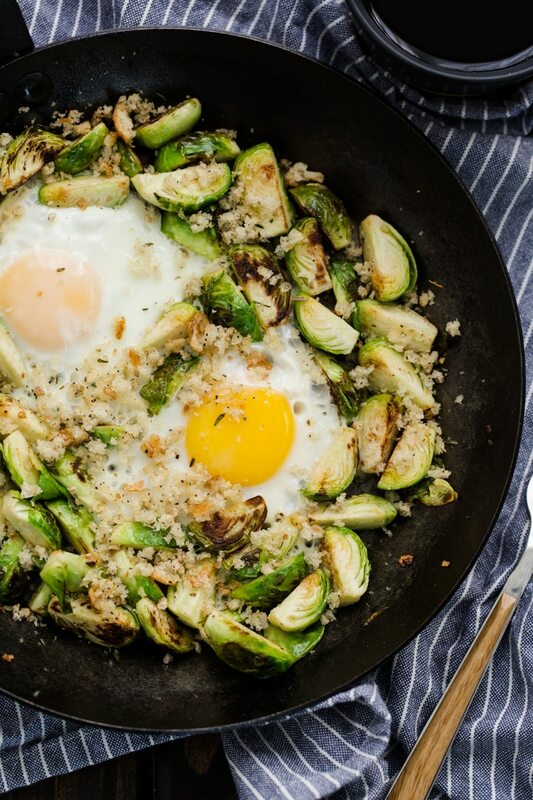 Brussels Sprouts and Eggs | Naturally. In the realm of cooking and recipe creation I am 1 part creature of comfort and 1 part explorer of all things. You may notice on this site that I like to reuse ideas in different iterations for recipes (ie: creature of comfort). If I try a new dish or find new flavor combinations I love, I branch out into something new (1 part explorer). I find this balance to be rather satisfying because on days I don’t feel like cooking or need something quick, I summon my backlog of recipes/meals I’ve cooked and whip up something similar. This particular dish is an iteration on a recipe I could barely bring myself to call a recipe (this asparagus and egg dish, to be exact). This dish is as simple as pan frying asparagus and cracking eggs on top. Given that it’s winter and there is no asparagus to be had, I reached for one of my other favorite hearty green vegetables: Brussels Sprouts. While this is the standard recipe, I’ve also been known to cook shallots or garlic with the brussels sprouts and sprinkle the dish with a bit of goat cheese before serving! Heat an 8″ skillet over medium-low heat. Melt the butter then add the quartered Brussels sprouts. Stirring occasionally, cook the Brussels sprouts until just tender and browning, 6 to 8 minutes. Create space for the eggs. 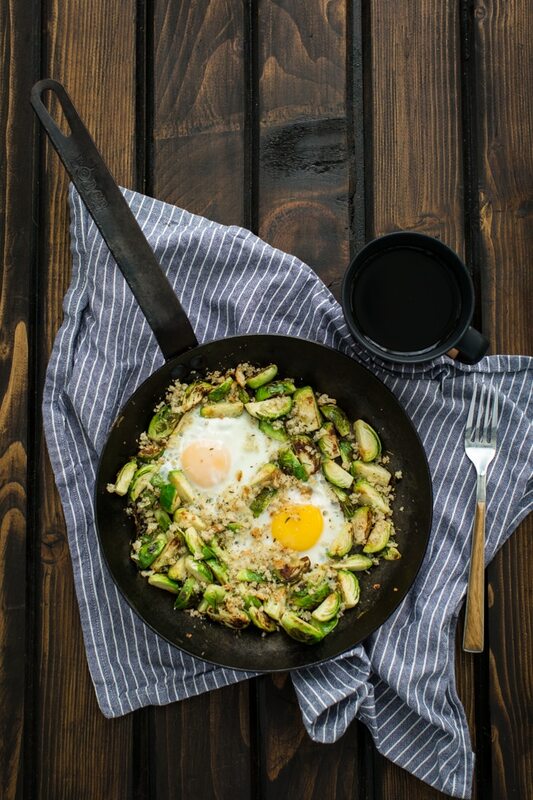 Crack the eggs into the skillet, cover, reduce heat to low and let cook until the egg whites are set and yolks have reached your desired consistency (roughly 10 to 12 minutes for over easy and upwards of 15 minutes for cooked yolks). I typically make homemade bread crumbs, akin to this recipe from Martha Stewart. 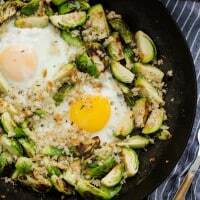 This is such a brilliant way to turn brussels sprouts into a meal that is a little more than my standard just eat roasted brussels sprouts straight from the pan. They are one of my favorite vegetables and so incredibly healthy. This is the perfect weeknight dinner! i absolutely love eggs and this is a great idea. Wow this looks amazing! I am such a sucker for brussels sprouts. Would love to know an alternative for this recipe for the eggs! What a perfect breakfast! I would prefer this with runny yolks too! Gotta add small cubes of sweet potato….I’m just saying! We’re still working our way through brussels sprouts from our autumn harvest. I love throwing them into egg skillets like this. The bread crumbs are a great addition!! I’m relatively new to the Brussel sprout world (I used to avoid them)…and I know love them. This looks like a yummy way to have them for breakfast…or have this breakfast for dinner! Oh, this sounds so delicious! You have to love a simple dish of tasty veg made into a full meal. I totally agree re: runny egg yolks too! I just made this for breakfast this morning and it was delish! I added a minced clove of garlic to the brussels, used a leftover Kings Hawaiian roll to make the breadcrumbs and sprinkled on some herbed goat cheese. The hubs said he never would have thought of using this veg for breakfast but we both enjoyed it. Thanks for the great recipe! I firmly believe that putting an egg on anything makes it 10x better. I wonder if cooking the Brussels in a little bit of maple syrup would give this a more breakfasty spin? Can’t wait to try it! I made this recipe for dinner tonight and it was so delicious! I know it’s simple, but I never would’ve thought to put brussels, eggs and breadcrumbs together. What a winner! I couldn’t help myself – I had to add a sprinkle of nutritional yeast as well. Thanks so much for sharing! I would mix in some small chunks of root vegetables For color texture and variety. Perhaps a parsnip, carrot or a little sweet potato. It would pair well with an interesting breakfast sausage Or a piece of smoked white fish. haven’t tried brussels spreads but this makes me want to!